Let me guess–you’re wondering why I would want to read a book telling me about what it’s like to be a man? That’s a good question, and to be honest, I don’t really know. I guess it has something to do with the fact that I love The Amazing Adventures of Kavalier and Clay by the same author, as well as The Yiddish Policemen’s Union. Also, can you believe that cover art? Come on, I’m a total sucker for packaging. I couldn’t resist. The whole book is a series of short essays that all have to do with coming of age, learning what it means to be a man, falling in love, getting married, getting divorced, and being a father. 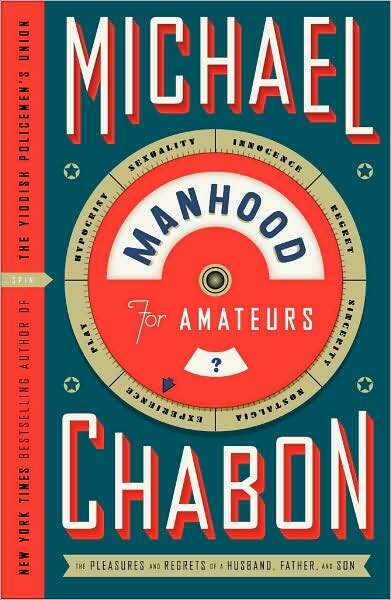 From difficult moments like the realization that divorcing his first wife will also mean losing a relationship with his father-in-law, to short interludes about drawing superheroes with his own kids, the book as a whole leaves you with a compelling view of the journey into full-fledged manhood. As a woman, this book was full of little lessons for me. I imagine that for a man, it would probably be more relatable, but I think I liked it best from an outsider’s perspective. It was like reading investigative journalism. Grab a copy if you have the chance! My kitchen is tiny. There are 2 cabinets, one large lazy susan sized cabinet that has to hold all pantry food, and one drawer. ONE. 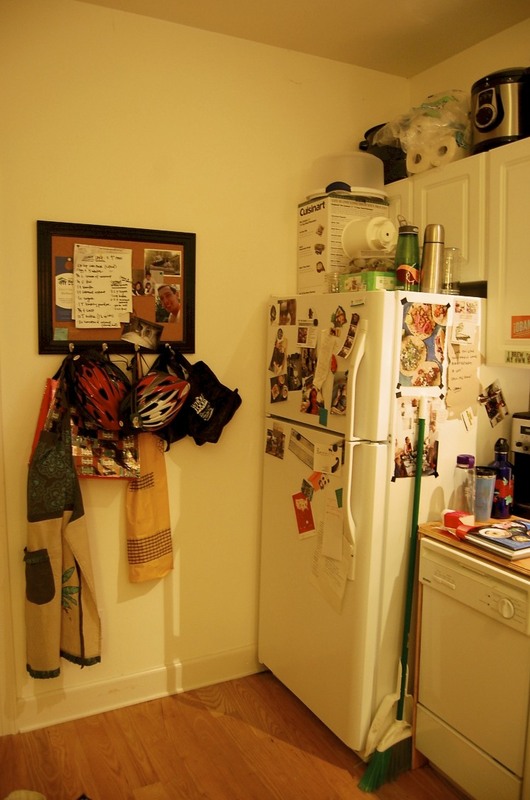 And let’s talk about all the things that I have that have to fit into said tiny kitchen. I have a blender, food processor, pressure cooker, 2 huge boiling water canners, a stand mixer, and right now, a borrowed juicer. And a coffee maker. And the thing that makes cold-pressed coffee. And those are just the big things! As you know, I like to cook a lot, and I absolutely refuse to be held back by our miniature oven and stove. 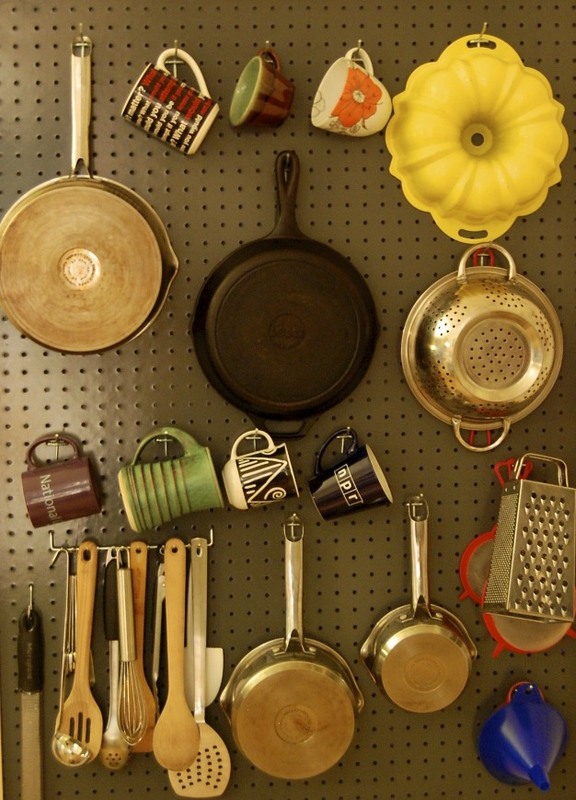 We’ve come up with some creative ways to store things, and added a lot to this kitchen. Here’s solution number one: peach crates as shelves. This is where we keep all of the dishes (excluding glasses) and things like disposable aluminum roasting pans, plastic baggies, tin foil, parchment paper and the like. I think there’s also a stray veggie steamer down there. Jason used to use these crates as bookshelves, and they’re just perfect because they’re deeper than most shelves and can accommodate large plates and things. 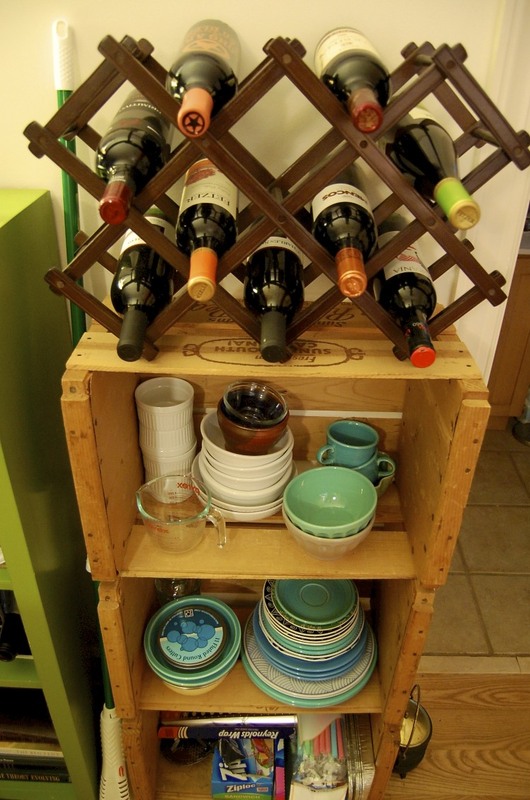 On top is a little wine rack that holds 10 bottles. When we first moved in, I was sure that this setup wasn’t going to be stable enough, but no one has knocked it over yet, so I’m guessing it’s okay (knock on wood). In this corner, we installed those wire shelves to hold appliances and canned food. It’s pretty high up there, but I can reach the food processor without a chair, and the jars are easily accessible when you stand on the counter. (That’s totally acceptable in my book.) The blender, one of the two dutch ovens that I own, and pot lids live up here too. I really love that hanging produce basket. It’s not the best place for it, but our ceilings are too high to hang anything from, and the wire shelving was really the only option. It’s a great place to keep potatoes, garlic, citrus fruits, and onions. Unfortunately, the stand mixer has to stay on the counter because it’s too heavy to put on the shelves. It tucks away nicely in that corner. The magnetic knife holder is also one of the best things that anyone has ever thought of. No counter space, and it holds everything from knives to bottle openers to scissors. This is my favorite thing in the whole kitchen. I’m going to have one of these in all the kitchens that I have from now on. As you can see, I keep almost everything with a hook on this pegboard. I’ve got 2 pans, 2 pots, a bundt cake pan, colander, vegetable steamer (why do I have two of those? ), strainers, 7 coffee mugs, a funnel, box grater, and all my utensils (including spatula, wooden spoon, slotted spoon, wooden spatula, ladle, pasta grabber, tongs, measuring spoons, rubber spatula, whisk, and microplane zester). We used spray paint to paint the pegboard a dark gray color, and framed it with little pieces of wood. It’s absolutely amazing and makes that wall space super useful. I have no idea where we would put things without this. This is on a tiny piece of counter that’s to the right of the stove, and I keep all the things that I reach for all the time in these chef’s squeeze bottles. I have grapeseed oil, olive oil, canola oil, honey, apple cider vinegar, and balsamic vinegar. I can’t tell you how much easier this small idea has made my life in the ktichen. 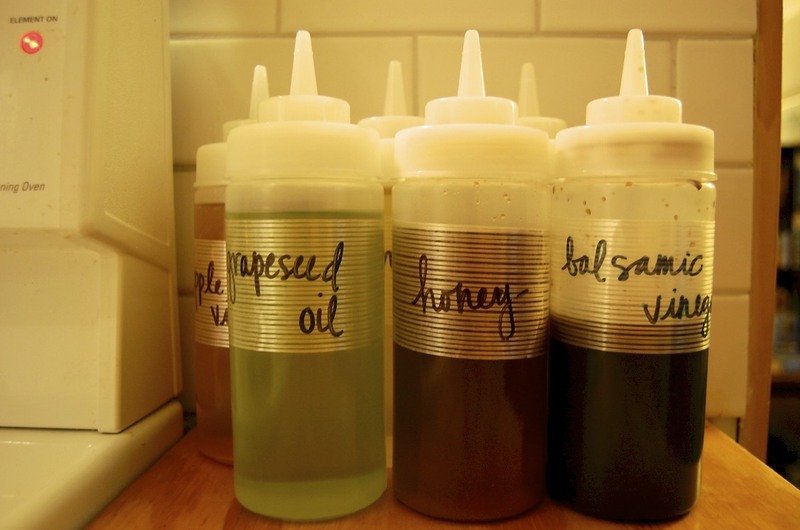 It’s so easy to reach for a labeled squeeze bottle instead of digging for the right thing in the pantry. Also, it’s way easier to get liquids into a pan or onto a salad when you can squirt them. I ordered these from Amazon for $11. Counter space is precious in this kitchen. But, there are certain things that just need to be out and accessible and ready to use. For me, spices are one of those things. 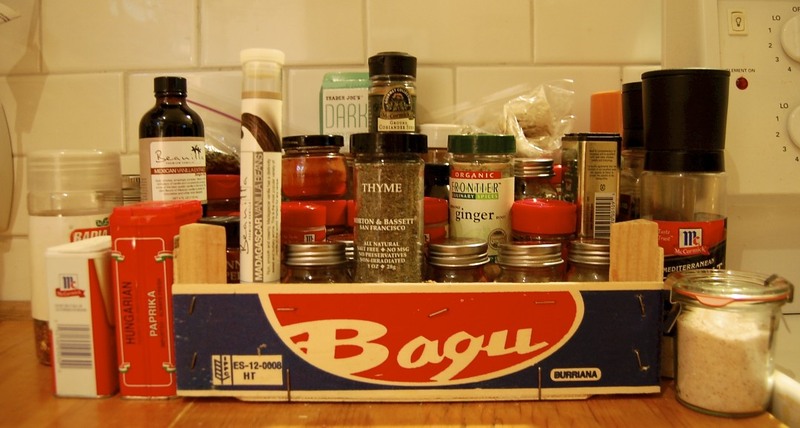 So, I use this clementine box to try to restrain all of my spices in this space to the immediate left of the stove. Sometimes they’re sort of precariously balanced on top of each other, and Jason can’t ever find anything, but I know where things belong. For example, I can tell you that under that thyme on the front row, there is a little thing of ground mustard. I don’t know how I keep track of these things, but it works. I also put things that I have big containers of into smaller jars and store the rest in the pantry. I have a ton of spices. It’s kind of absurd. This corner is (obviously) where the refrigerator is. There is a cabinet back there, and I keep unused jars and other canning supplies in it. It’s really hard to get to. 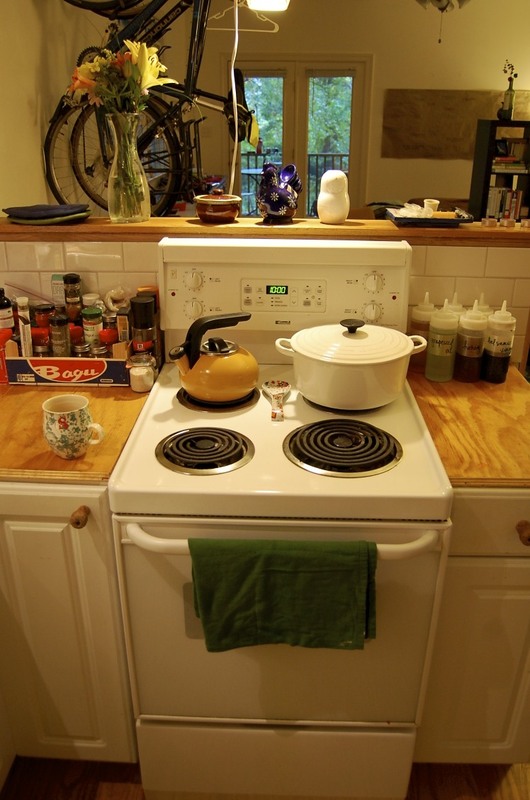 On top of the cabinet are the boiling water canners and the pressure cooker. Also, paper towels. And that huge thing you use to carry cakes. And the box for the food processor (which is also where all the extra attachments live.) I really love the bulletin board with the hooks on in that we have. It’s great for lunch boxes, grocery bags, bike helmets, aprons, and all kinds of things. 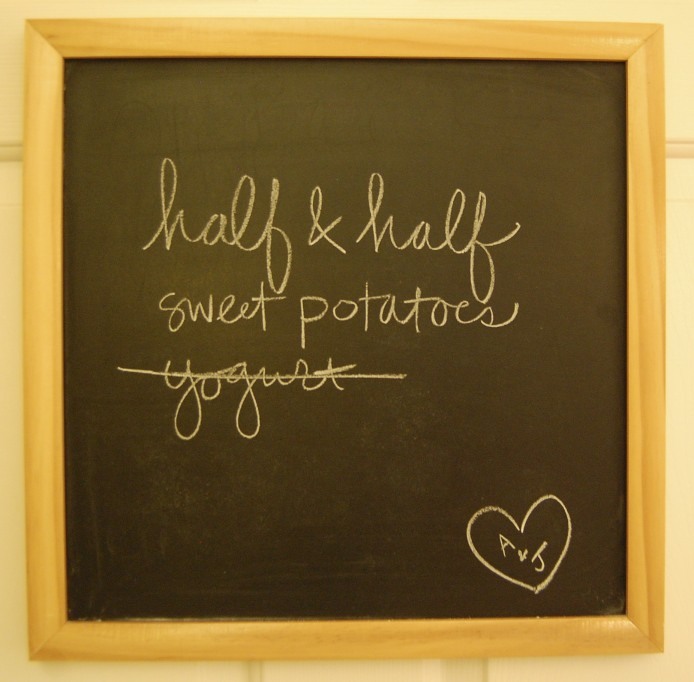 Last but not least, the chalkboard! I keep a running grocery list going, and this is the perfect place because it’s on the back of the door to the apartment so I have to look at it every time I leave home. No forgetting things to buy. Here’s a view of the stove. Under the oven, there is one of those drawers that holds 2 cookie sheets, a muffin tin, casserole dish, loaf pan, cake pans, and several other pans and clay things that you can bake things in. The teapot and the huge dutch oven stay on the stove all the time. 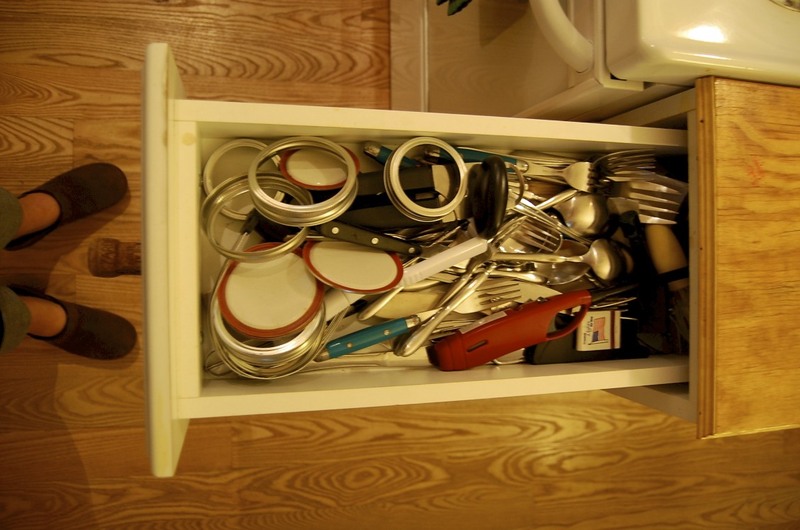 This, my friends, is my one and only drawer. It holds all the silverware, serving spoons and forks, lighters, jar lids, can opener, and lots of other strange things. Generally, I’m just lucky if it closes. It’s the little things that keep you going. 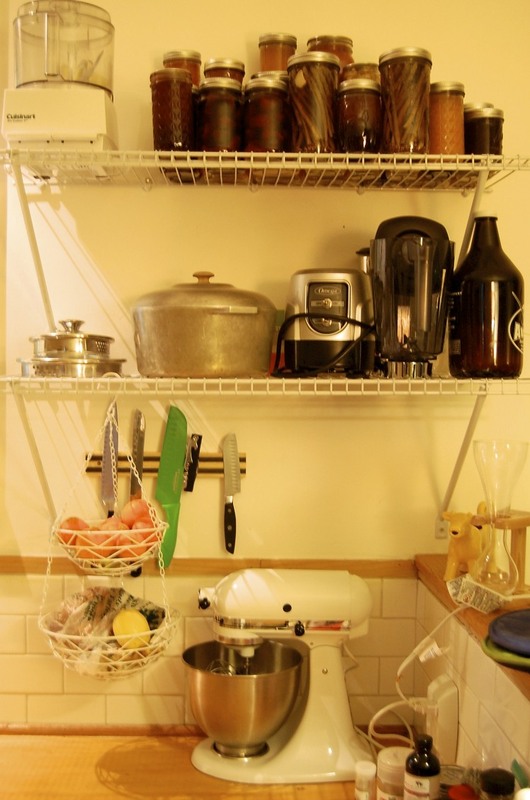 In a tiny kitchen, you really have to maximize space. It’s all about saving space and really thinking about what you have and why you have it. I really think you can do anything in a tiny kitchen, and I haven’t run into anything I can’t do yet. I also (if you can believe it) have a list of more things that I want to include in the kitchen, but I do have to plan where I’m going to keep them before I get them. Jason has this theory that in order to convince people that he knows how to speak french, all that he has to do is omit most of the letters in a word, and say the rest while never fully closing his mouth. So, “bonjour” is “bohjuh” and “aigre-doux” (bitter-sweet) is pronounced “ahra duh.” This does not work, in case you thought it might. It just makes him look a little like he’s having a stroke. If you make this aigre-doux, you should totally pronounce it in a crazy way because you totally can. Because you made it. 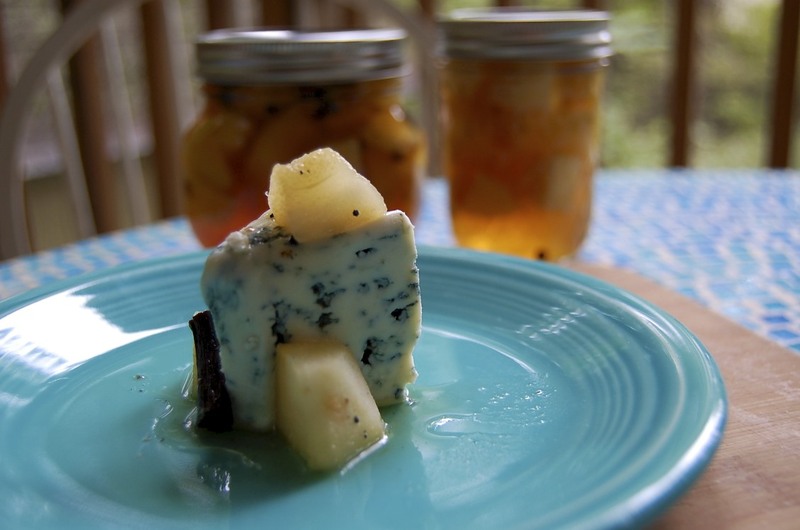 This recipe came from a cookbook called The Preservation Kitchen by Paul Virant. I’ve never seen an aigre-doux (by that name) before this cookbook, and I’m really excited about this one. There’s also a butternut squash aigre-doux and a cranberry aigre-doux that I can’t wait to try. The mixture of sweet and salty/spicy is really incredible, and I’m really excited to save it for winter. 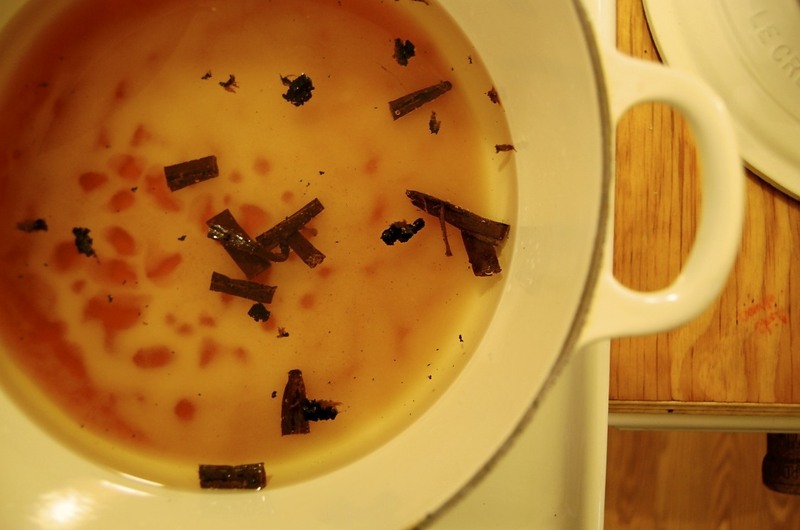 In a large pot, combine the wine, champagne vinegar, honey, sugar, salt, vanilla beans and seeds. Bring it to a boil, stirring constantly, then turn the heat to low to keep it hot. In a boiling water canner, simmer 4 pint jars or 8 half-pint jars and their lids and bands. Put the peppercorns in each jar, then pack in the chunks of pear. 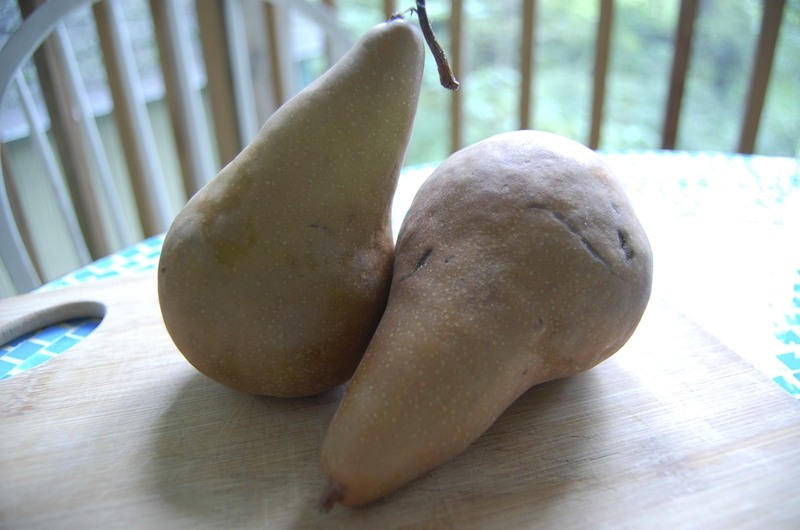 Ladle the hot mixture over the pears. Leave about a half inch of headspace in each jar, wipe the edges with a clean towel, then place the lids on top and gently screw on the bands. Process them in a boiling water canner for 15 minutes. Let them cool completely before testing the seals. 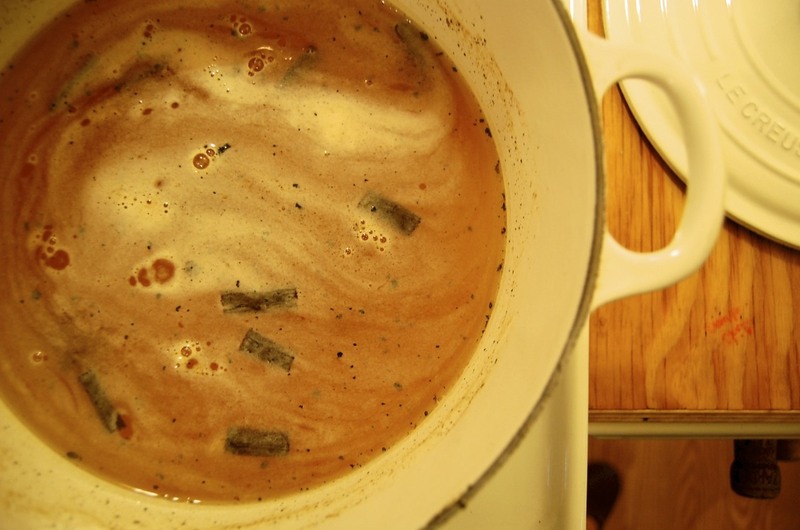 To serve, put the aigre-doux into a small pot and heat it slowly, stirring constantly. 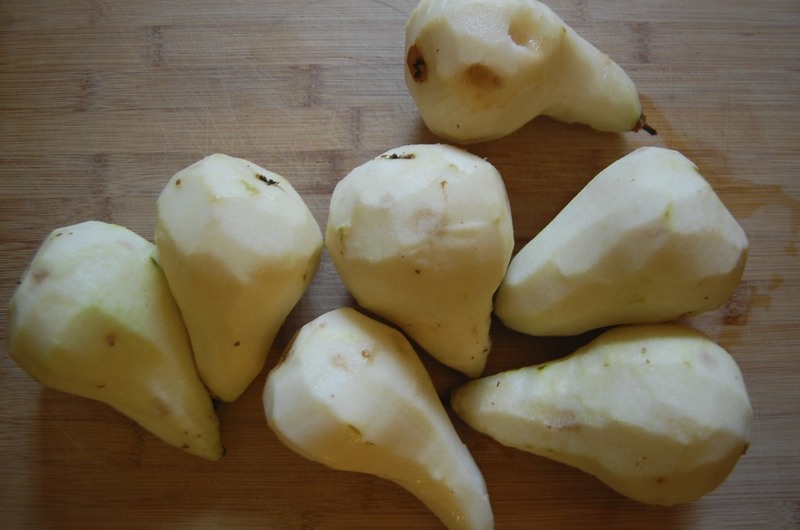 Allow the juice to thicken up and the pears to soften. Then, serve it over a strong blue cheese with some crusty bread. It’s like fall on a plate! Does it totally blow your mind that fancy cocktails cost so much? I had a dark and stormy the other day at a bar here in Carrboro, and it was $9! It was delicious, but nine dollars! I feel like making drinks at home is the way to go… right? I mean, let’s be honest–I’m intimidated by things like vermouth and bitters, but I can handle the basics. This cocktail–it’s sort of a Pimm’s cup–is just right. And, it totally tastes like a nine dollar drink. I have to tell you about this gin. It’s made in North Carolina! A company called Southern Artisan Spirits makes it, and they’re located in King’s Mountain (near Charlotte, and the site of a Revolutionary War battle). I’m gonna be honest–I don’t know much about gin, but I’ve done some research about this one, and the fact that it’s “dry” means that the botanicals (juniper and other things) are added after the fermentation. Past that, I’m not sure. I think that an American dry gin is made the same way as a London dry gin, but, of course, in America. The pine-y taste that I associate with gin is actually juniper, which is the primary botanical added to gin to flavor it. 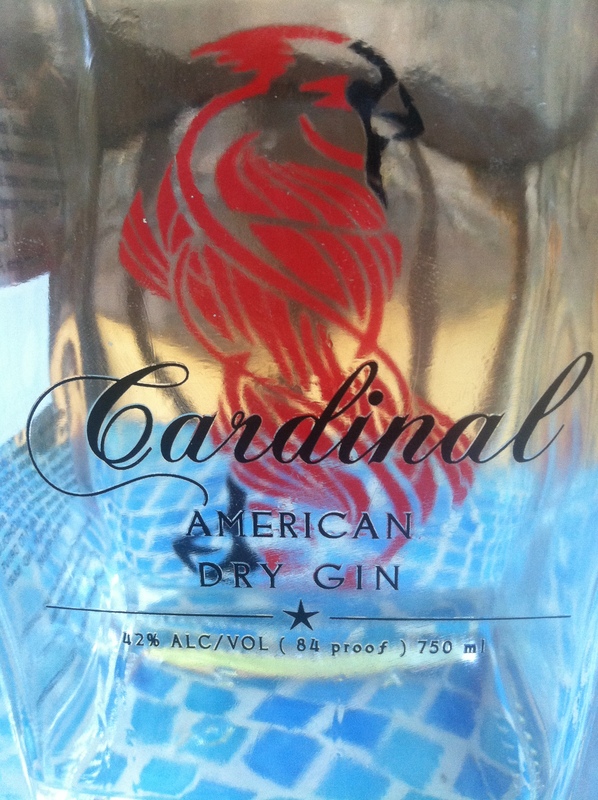 As far as I can tell, Cardinal gin is a little less juniper-y than a London dry gin, but it still has a strong botanical flavor. You can find this gin in a ton of North Carolina liquor stores (so says their website), and in a few other southeastern states, too. It’s about $30 a bottle. Mine was a gift! 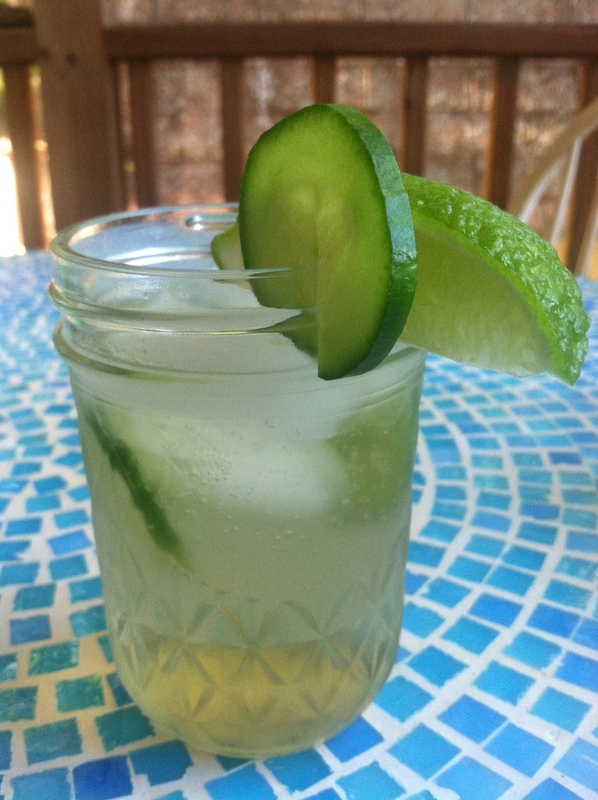 In a small glass, combine the ice, gin, ginger ale, 3 of the cucumber slices, and a squeeze of lime juice. 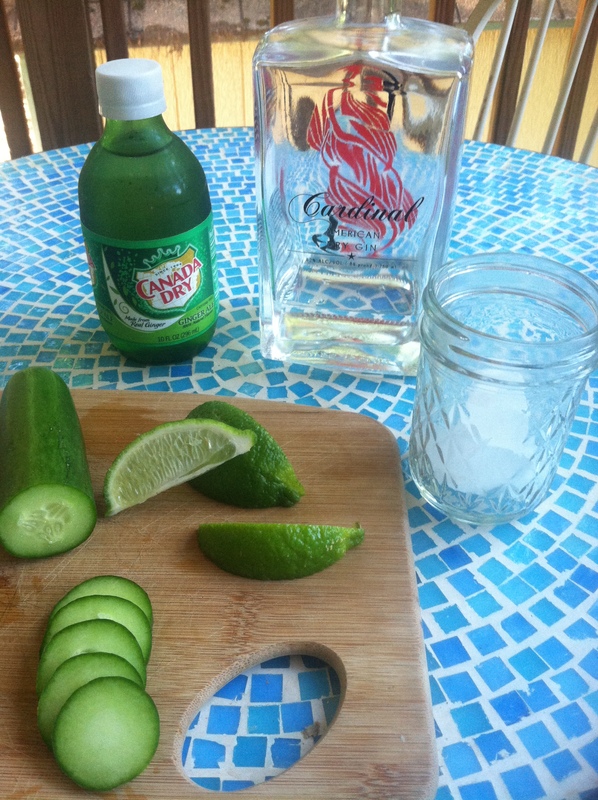 Gently stir, then garnish the glass with the remaining cucumber slice and the lime wedge (if you’re feeling fancy). If it’s as beautiful there as it is here, drink your fancy cocktail on the porch with a good book. Are there people out there who inspire you? People who do (or did) things in a way that you think is really smart, and maybe you want to do things the way that they did? Julia Child is one of those people for me. Reading her memoir, I was pleasantly surprised by her lifestyle, her method of exhaustively testing and retesting recipes until they were perfect, even her love for walking around markets and learning how to choose and later prepare foods. She was smart, opinionated, headstrong, and willing to work hard everyday for what she believed in. Although she and her husband, Paul Child, were never terrifically wealthy, they lived in a way that made use of every thing and every experience they could lay their hands on. Although she became terribly famous here in the states for her work in writing recipes, she had to start learning somewhere. While she and Paul lived in Paris, Julia cooked incessantly. 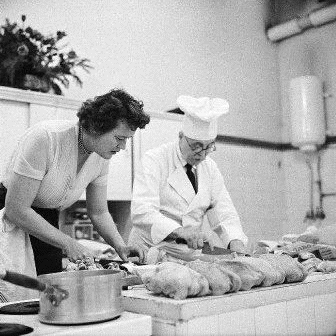 She took classes at Le Courdon Bleu, she taught cooking classes, and she obsessively perfected any method she sought to learn. 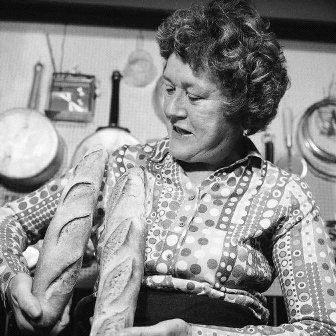 Because she was so headstrong, Julia Child ignored the fact that she didn’t know French–she tried until she could speak it. She ignored the fact that she was terribly intimidating to men due to her loud, booming voice and six-foot-two stature–she refused to quiet herself or appear more lady-like, she simply embraced her personality and waited for those who could handle it. Unless it affected her health, Julia didn’t turn down a buttery sauce or a heavy lunch. She ate in moderation and maintained her health, but she never skimped on flavor to save her figure. She was insistent and almost comically determined and entirely unself-conscious at everything she did. I think those qualities in her are entirely admirable, and I hope to be as determined and secure as she was one day. I love the idea of standing in my kitchen for hours, using pound upon pound of flour to make the perfect baguette, or the perfect pizza dough. 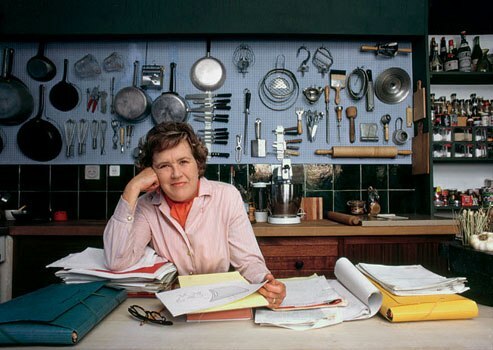 Julia Child never let “almost good enough” get past her–she either threw away the idea entirely (after exhaustive testing) or she absolutely perfected it. Her memoir, My Life in France, is a lovely little book, full of detailed remembrances of specific meals, and an interesting take on the success of her cookbook, Mastering the Art of French Cooking (co-authored with Simone Beck and Louisette Bertholle). She wrote the book in her eighties, with Alex Prud’homme, her nephew, as co-author. As you’d expect, her voice shines through the words in a really remarkable way. I’m not sure if that’s due to her nephew’s skill or her own distinctive wit and sharp memory. Perhaps a combination of both? However it came together, the result is just wonderful. 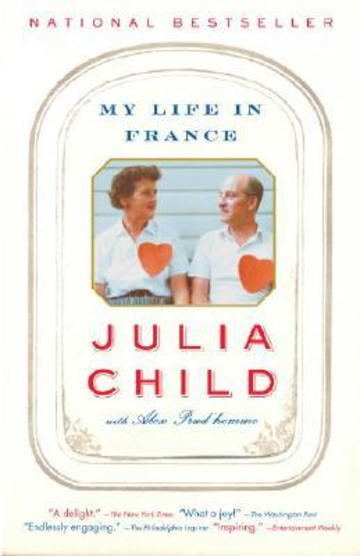 One of my favorite parts of the book was Julia’s relationship with her husband, Paul Child. They never had any children, and married late (especially for the time), when Julia was about 35. It seems that Julia’s work would have been entirely impossible if not for her husband. He encouraged her, and served as a wonderful partner to her work and adventures through their lives. I think that their relationship was one for the books–it really encompasses the word “partner,” which is really what a spouse should be, right? I love one story that Julia tells in the book, when she decided that there should be pictures in the cookbook, so Paul photographs Julia’s hands trussing a chicken while lying on the kitchen floor–all so that Paul can get the right angle and be able to see the chicken from the chef’s perspective. Those photographs were used by the book’s illustrator to draw simple line drawings of the chef’s hands at work. 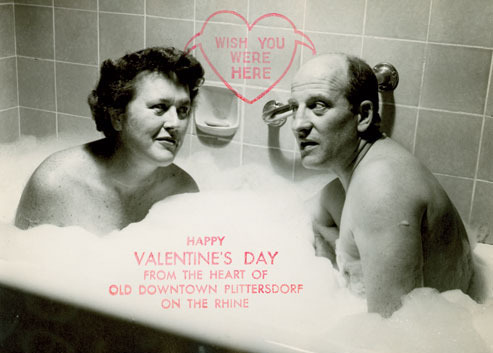 Every Valentine’s Day, Paul and Julia sent cards to their families rather than Christmas cards. This one, from when they lived in Germany, is my very favorite. “I don’t believe in twisting yourself into knots of excuses and explanations over the food you make. When one’s hostess starts in with self-deprications such as, “Oh, I don’t know how to cook…” or “Poor little me…” or “This may taste awful…”it is so dreadful to have to reassure her that everything is delicious and fine, whether it is or not. Besides, such admissions only draw attention to one’s shortcomings (or self-percieved shortcomings) and make the other person think, “Yes, you’re right, this really is an awful meal!” Maybe the cat has fallen into the stew, or the lettuce has frozen, or the cake has collapsed–eh bien, tant pis! Pie is one of those things that I’ve always been afraid to make. Is that just me? Maybe it’s because I like to EAT pie so much so I’m afraid of making a subpar pie. And then I’d have to eat that less than great pie. Is that a thing that other people worry about? Is that just me? Don’t tell me if it is. I’ve always thought it was just easier to eat someone else’s pie. I’m here to tell you that I’ve swallowed my pie-related fears and I’ve been practicing. I’ve made a few, but this is by far the best. 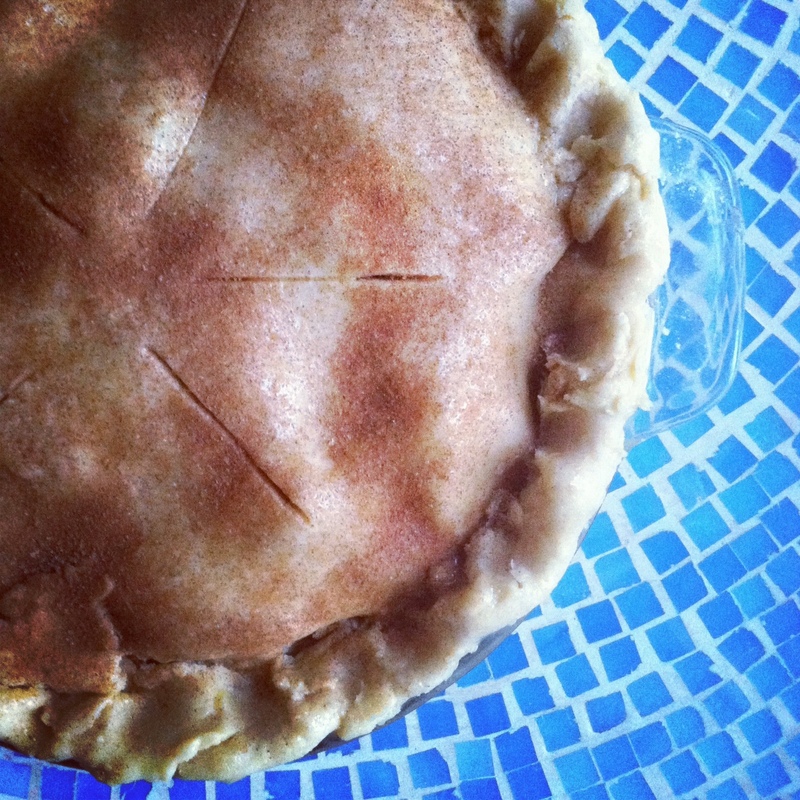 It’s like the fading last few days of summer baked into a pie pan inside of a flaky, buttery crust. 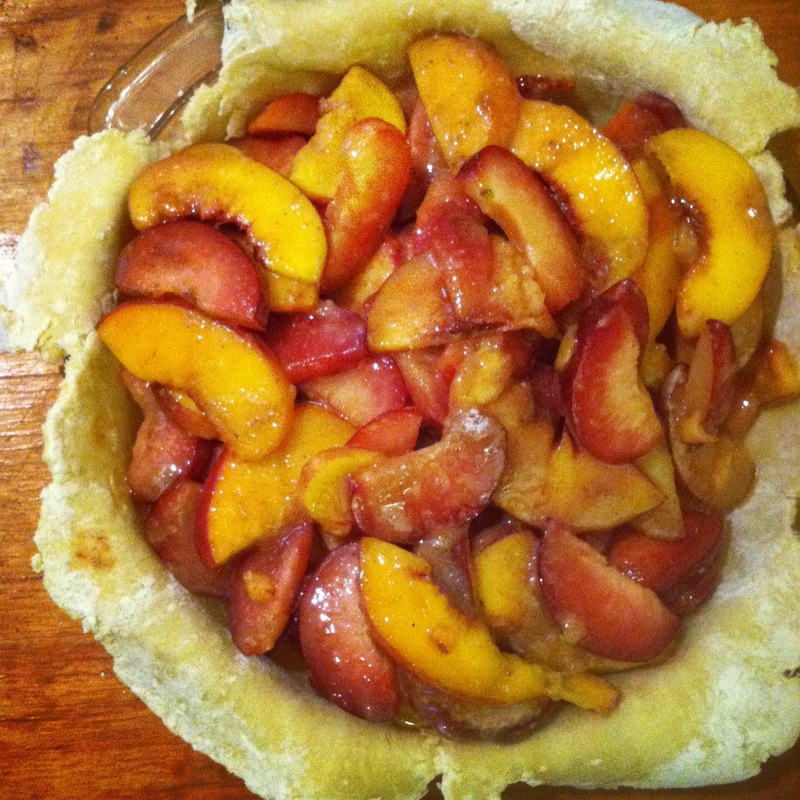 It showcases the stone fruits that I love about this part of the year in the best way. It’s not too sweet, but just right. Goldilocks would be all about this pie. 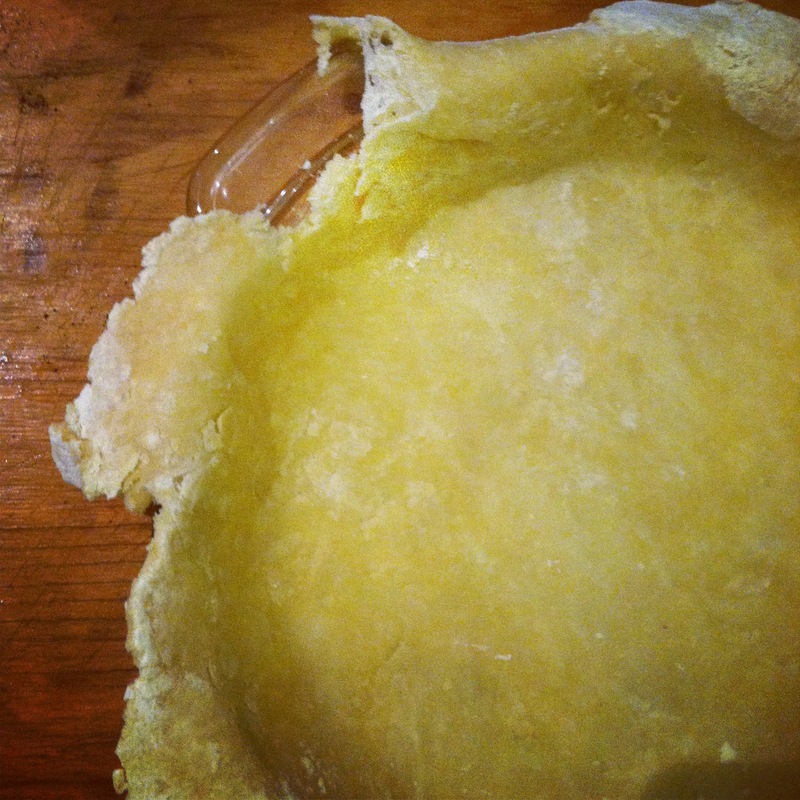 The thing about making pie crust is that you have to be patient. You can’t make the dough cool down any faster. You can’t rush rolling it out or pressing it into the pan. It takes concentration and solitude the first few times. It demands deep breaths and a little bit of love. So put on your cutest apron and most comfortable shoes and let’s get down to business! Start by cutting the butter into cubes. I’ve found that nicer butter is better. Isn’t that such a pain? It’s more expensive, but if you want your pie to wow people, it helps. I get Kerrygold butter from Trader Joe’s (it’s about $2.50 for the equivalent of 2 sticks). Then, combine the water with the apple cider vinegar and put both into the refrigerator. Okay, now combine the flour, sugar, and salt in a large mixing bowl and whisk gently. Check to be sure that your butter cubes are very cold. Like I said before, don’t rush it. When it’s ready, quickly incorporate the butter into the flour mixture using your fingers or a pastry cutter. Work on it until the largest pieces of butter are no larger than peas. Make a well in the center and pour in the water/vinegar mixture (should be very cold). Using a fork, incorporate the wet into the dry. When the flour isn’t loose anymore, turn the dough out onto a well floured surface. It should be very shaggy and wet, that’s okay! Divide the dough in half and gently knead each ball until it’s cohesive and smooth. Flatten each ball and wrap them in plastic wrap. Put both balls into the refrigerator for one hour. A whole hour, yes. Don’t be impatient. Chop all the peaches and plums. I generally like thinner slices rather than big chunky pieces, but that’s just me. You choose. Cut them up, however you please. Then, toss them with everything else. Put them in the refrigerator to hang out together while you wait for the pie crust to be done chilling. 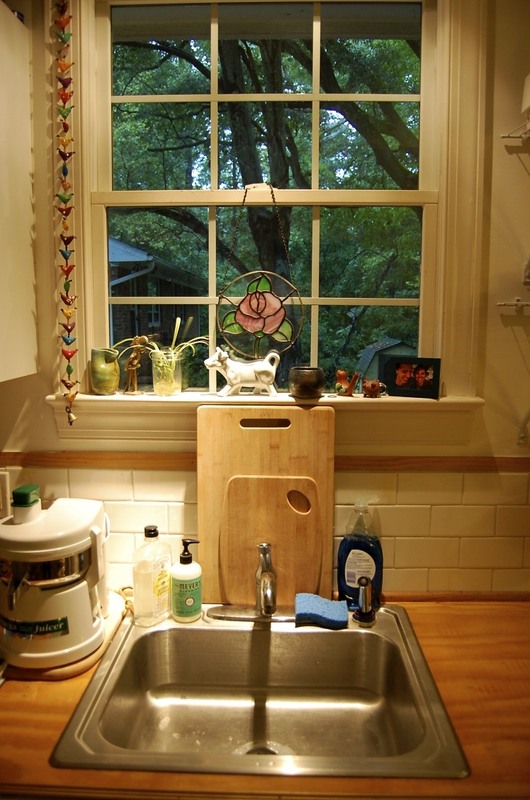 You could wash dishes while you wait. Or you could be like me and drink a beer and watch 30 Rock for a few minutes. Thank you, Netflix! When your hour is up, take out a 9″ pie pan, and butter the bottom and sides. Then, take one of your dough discs out of the refrigerator and put it onto a well-floured surface. 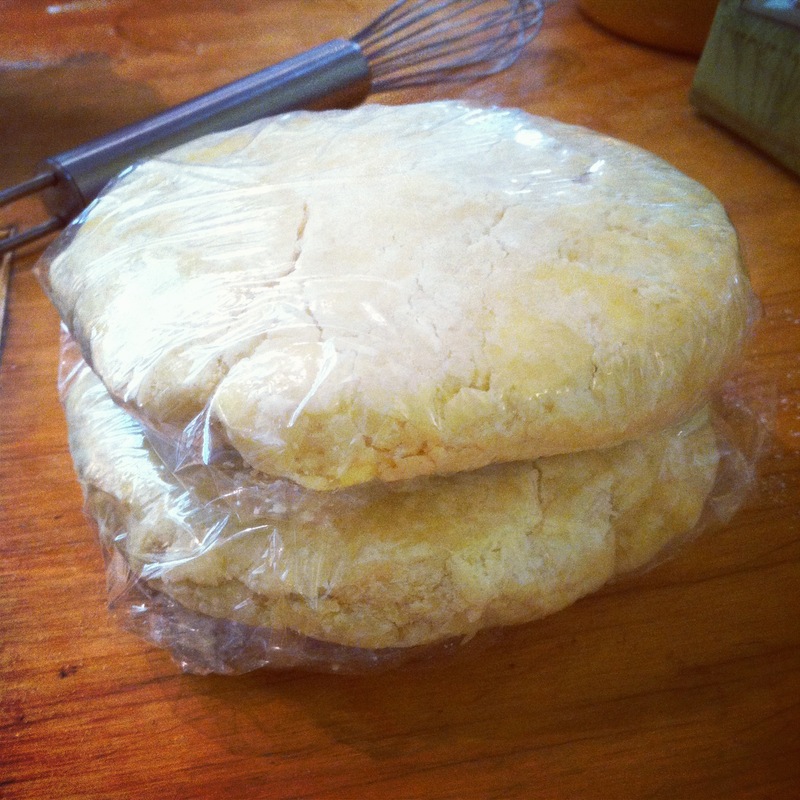 Using a floured rolling pin (or a straight glass), roll the dough disc out as round as possible. I’m still working on the round part, so don’t stress if you’re not so great at that. Just get it into the pan with the edges hanging over. No matter how much. Once the bottom layer is in the pan, gently pour the fruit mixture into the center of the pan. Next, take the second disc of dough out of the fridge and roll that one out exactly the same way. Carefully place it on top of the pie filling. Trim the edges of both layers of crust, then use a fork or your fingers to crimp the two layers together. Make it pretty! Last, cut several lines in the top of the pie to allow it to vent while it cooks, then gently brush a beaten egg on the top. Sprinkle generously with cinnamon sugar. Bake at 400 for about 15 minutes, then reduce the heat to 375 for 40-50 minutes. Your time might be a little different, but it’s done when the filling is bubbling and the crust is golden brown. Let it sit for 2 hours or so before eating. You really just want it to be warm. Serve with vanilla bean ice cream. This pie should make you feel accomplished and competent. You just made a pie! From scratch! With flour and fruit and a rolling pin! Savor those last few warm days of the year with this pie–it’s so worth the work.